I cannot get enough of this bread! It was inspired by one my grandmother used to order for special occasions from an Italian bakery. Smaller slices make a great appetizer. 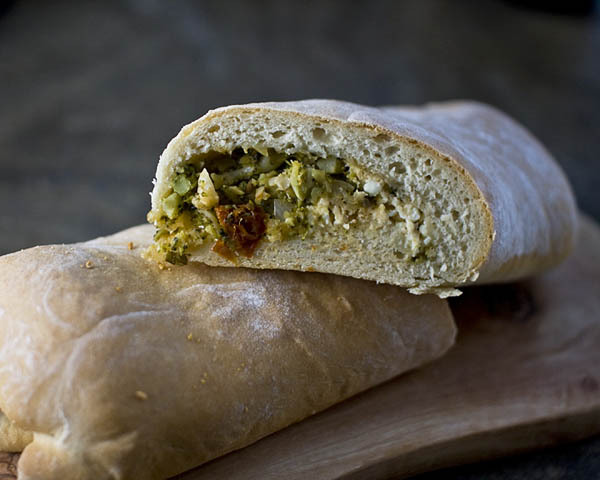 But half a loaf or so makes a portable and delicious lunch that keeps well and tastes great at room temperature! I make my own bread dough from scratch, but frozen dough would make this go a lot quicker. I let it rise for an hour, punch it down, divide it in 3 by weight, then roll it out.To make the filling, heat a bit of olive oil in a skillet. Add the onion and sauté until it softens, then add the garlic and sauté another 30 seconds or so. Add the sundried tomatoes and cook another minute, then add the broccoli, cayenne, paprika (I use smoked), salt, and pepper to taste. Stir to combine and cook a couple more minutes to meld the flavors, then let it cool. 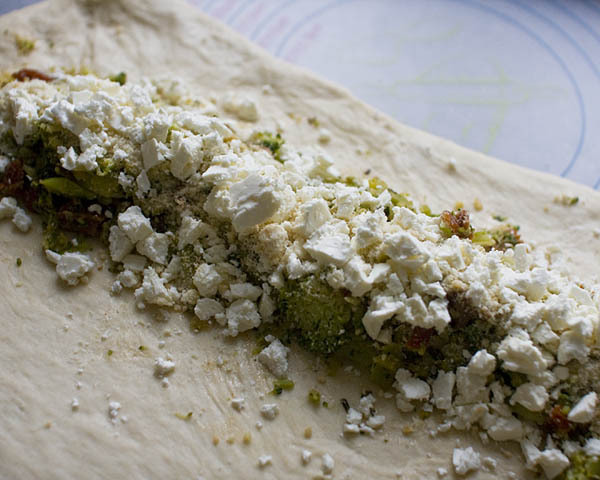 Roll a third of the dough into a rectangle of about 12″ x 9″. Spoon a third of the mixture down a long side of the dough, sprinkle with 2 T parmesan and 1/4 cup feta, then tuck in the edges and roll it. Place it seam side down on a greased cookie sheet and repeat with the other 2/3 of ingredients. Bake it at 350 degrees for 40 minutes or until it starts to brown. Cut it into 2″ wide slices for appetizers, or slice the loaf in half or in thirds for a light meal. I like it best cooled slightly or at room temperature.